This recipe came about from a “once around the kitchen” dinner night. I threw in everything I already had that I thought might work together. I really like southwestern flavors, and you can easily add some chopped jalapeño and cayenne pepper if you want it spicy. Sauté onion, carrots and celery until soft. Add rest of ingredients except for lime. Bring to boil, then simmer for awhile till combined. Swish in lime juice at the end and check seasonings. Try it with cilantro, avocado, and dairy free mozzarella-type cheese on top. This recipe was inspired by the Potassium Balance Broth in the Hungry For Change cookbook. I wanted more of a tomato soup, so this is my variation. It’s a great, simple soup that is easy to digest and is super good for you. I always seem to want more of this one! 1. Put all ingredients, except crushed tomatoes, in a pot. Bring to a gentle boil, lower heat and then simmer very gently for 30 minutes, with lid on. The original recipe calls for the 3 tomatoes, but I found I wanted more tomato flavor (especially when tomatoes are out of season and not so yummy), so I added about 26 oz. crushed tomatoes (I use Pomi brand). 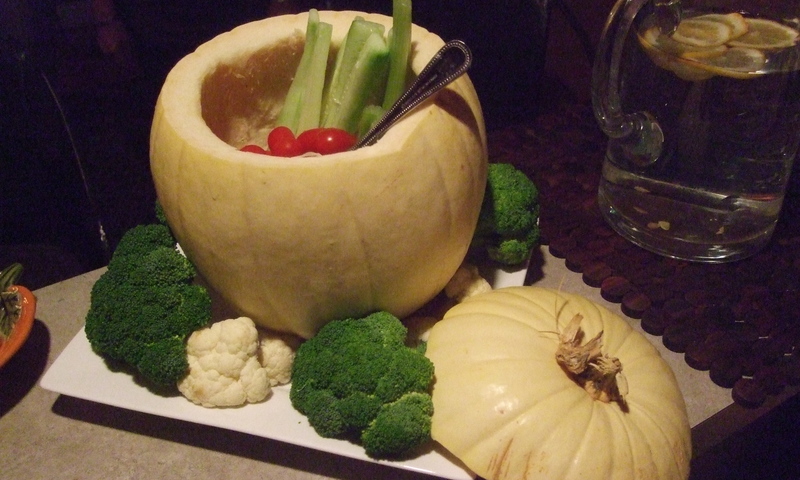 I used one of those “boat motor” immersion blenders and blended it (didn’t strain it – I wanted all the fiber from all the good veggies!) until it was a little bit smooth, a little bit chunky. Then I added some fresh herbs and I ate several bowls of it! 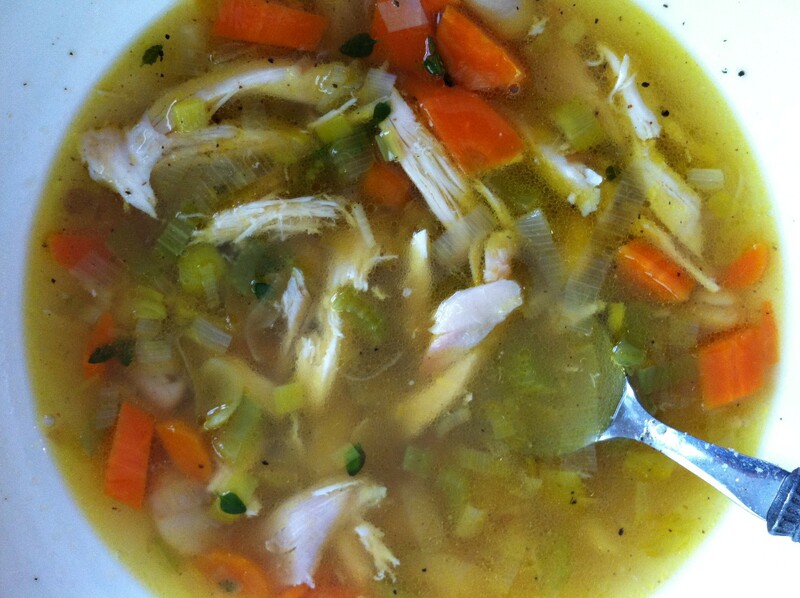 I thought it was good – really light and tasty and my body seemed to really love it as well! Ok, it’s been crazy hot out here. And if you’re like me, you don’t feel like eating a lot, much less preparing a big meal. Instead of reaching for the bowl of ice cream (not that we’d ever do that! ), take advantage of all the wonderful veggies that are in season. Check your local Farmers Markets and eat locally when you can. 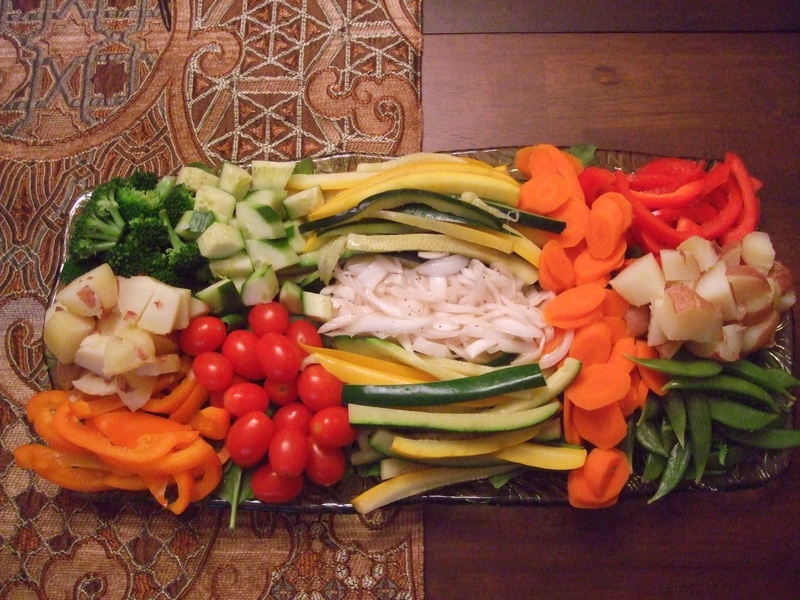 Cut up and serve raw or lightly steam them, and have some fun things to dip them in. Try some homemade mayonnaise, your favorite salad dressing, even a jar of salsa works. It’s a fun, easy, light meal and your body will be so happy to have those extra vitamins and minerals. A perfect meal for this hot weather, and a joyous re-uniting of flavors for those of us who are not eating grains. 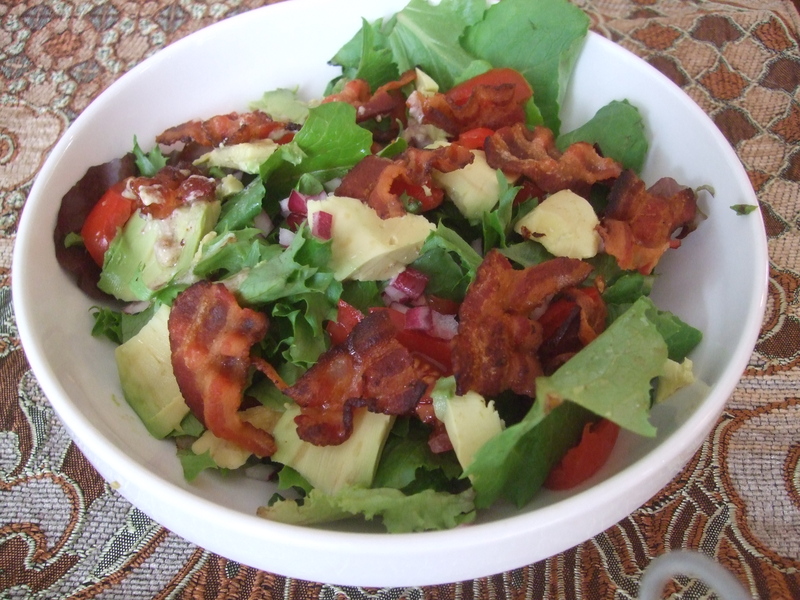 I have to admit, that a great BLT is something I do miss, so luckily my sister (Dr. Cary) came up with this easy solution to solve the cravings. Fry up several slices of bacon (nitrate/nitrite free please! Trader Joe’s has a great one). While they are frying, put together your favorite salad ingredients – cool crunchy lettuce, tomato (of course) then add red onion or scallion, cucumber, even avocado is great. After the bacon is cooked and crispy, let drain on paper towels, pour out leftover bacon grease from pan but don’t wipe out all the yummy parts on the bottom of the pan-that’s where all the flavor is. Add about two tablespoons (or more if you like a lot of dressing) of mayonnaise, either homemade or straight from the jar and let it warm up and get all creamy. You will probably have to add some water to dilute it, so start with just a bit and add in as you need to thin it out. As you stir it around, it will pick up all the bits of flavor left at the bottom of the pan. 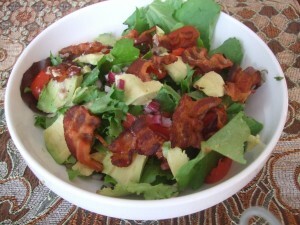 This only takes a few moments, so just add your crunchy bacon to the top of your salad, pour on the warm dressing and toss. It’s a BLT in a bowl!!! Full of flavor and makes a great summertime dinner. For those of you who really need that bit of bread, use your favorite gluten-free (or regular if you are still eating that) bread, chop it up in big chunks, and toast in a saute pan with some olive oil and salt until crisp and crunchy. This makes the best croutons and would be fabulous mixed in with your BLT salad. Although this has an unusual name, it’s very much like a crustless quiche and is another great basic dish that can be used with countless different ingredients. For years I have made a Plum Clafouti which is one of my all-time favorite deserts, but I had never seen it used with savory ingredients. 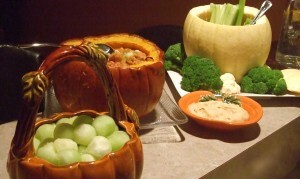 I originally saw this recipe on one of my favorite blog sites, Mark’s Daily Apple. 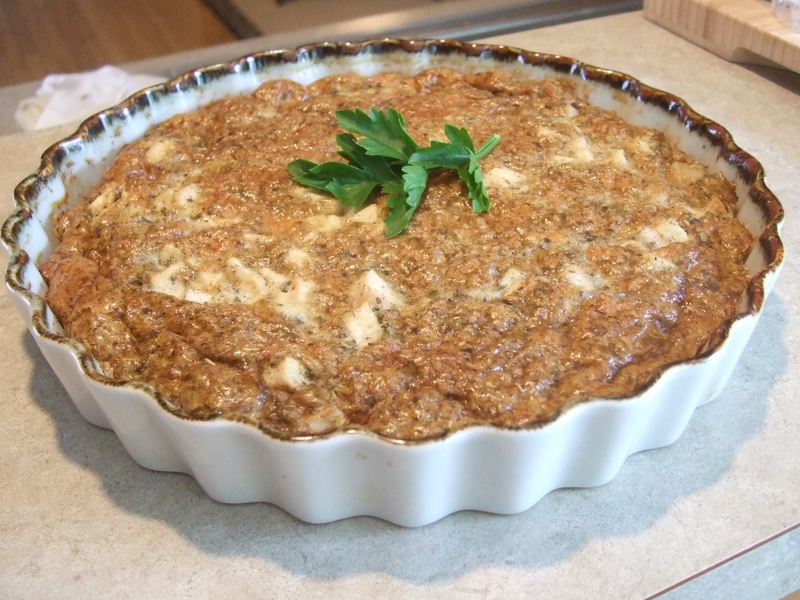 Click over to Mark’s site to see the full explanation, and to see the original recipe which is a Chicken Curry Clafouti. Since I’m not a curry fan, I decided to go in a different direction. You could easily use this recipe with chicken, salmon, sausage, etc. but I am always looking for another way to use turkey, so tried this with some leftover turkey breast I had in the freezer. I used a spice mixture that was specifically for turkey, used mostly for Thanksgiving dinners, I’m sure. It made the house smell heavenly! Give this a try using your favorite combinations and let me know what you come up with! A few quick notes: I had come challenges with the clafouti getting brown too quickly, so make sure you keep a very close eye on it and start checking it at 25-30 minutes (recipe calls for a 45 minute cooking time). I also think next time I’ll try reducing the oven temperature from 400° to 350° so it doesn’t brown as quickly but still cooks through. Add all ingredients together and simmer for 10 minutes just until mixed and a little mushy. Place in tortillas with lettuce and toppings of your choice and enjoy. Also good cold as a dip or over nachos.